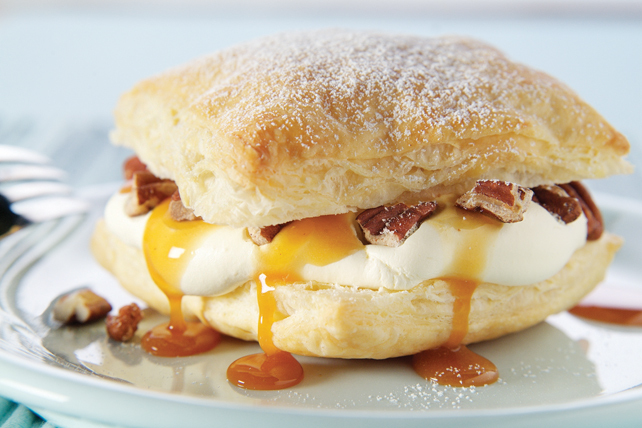 If you are hosting a dinner party, be prepared to receive tons of compliments on these Caramel Pecan Napoleons. Whether you share the recipe is up to you! Unroll pastry sheet on lightly floured surface. Cut into 3 lengthwise strips. Cut each strip crosswise into 3 squares; place on baking sheet. Bake 15 min. or until golden brown. Remove to wire racks; cool completely. Split each pastry square horizontally into 2 layers, making a total of 18 squares. Set aside the 9 top layers. Spoon 3 Tbsp. Cool Whip onto each bottom layer. Drizzle evenly with caramel topping; sprinkle with nuts. Cover with pastry tops; sprinkle with icing sugar. Store leftover desserts in refrigerator. Place nuts in single layer in shallow baking pan. Bake at 350°F for 5 to 7 min. or until lightly toasted.